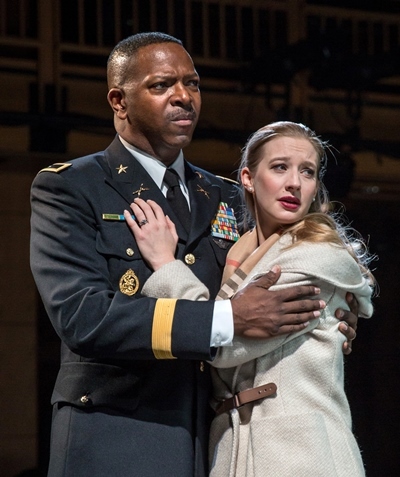 What is so striking about the current, altogether marvelous production of “Othello” at Chicago Shakespeare Theater is that the beleaguered Moor is no mere catalyst in the very events of which he is the object, but rather presents himself as a man – a great military general — worthy of his reputation. 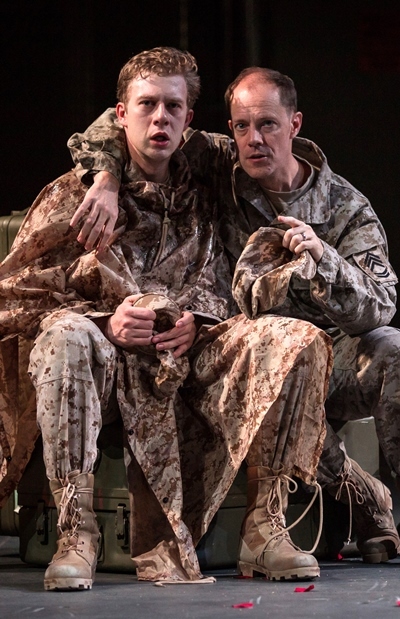 In the person of James Vincent Meredith’s Othello, and in the care of British director Jonathan Munby, Shakespeare’s play for once does not seem to be first and foremost about Iago. It is a dramatic realignment deeply to be appreciated. 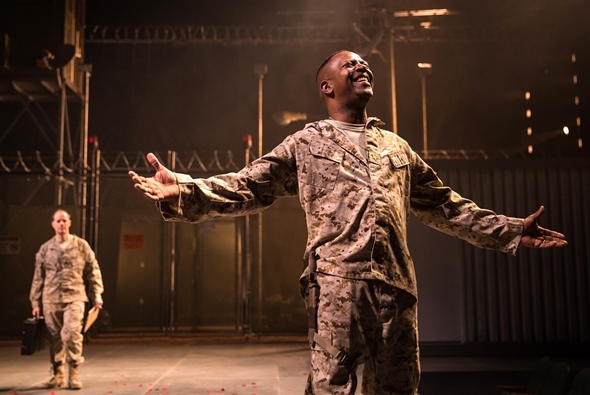 To be sure, Othello remains putty in the hands of Michael Milligan’s “honest Iago,” as wheedling, conniving, ruthless and vengeful a villain as ever you might wish for. But there is nobility in Meredith’s deceived and doomed man. He acts, speaks and carries himself with the measured authority of a tested warrior and assured commander. No wonder the fair Desdemona, a child of aristocracy, fell for him. Meredith’s physically imposing figure only gains further grandeur in costume designer Linda Cho’s handsome officer’s dress. When he strides into what today we would call the situation room, a late-night assembly of Venetian officials worried over a rising Turkish fleet, you get the immediate sense that everything’s going to be fine – though not so much for the Turks. Munby has placed this “Othello” in the timeless present, with spare modernist sets by Alexander Dodge. Indeed, the Duke of Venice is a woman (Melissa Carlson). 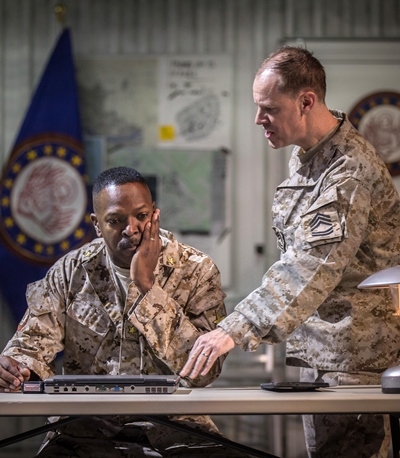 The soldiers wear modern battle fatigues and tote high-powered firearms, and officers consult laptops. As fathers from time immemorial have fretted about their daughters’ bad choices in husbands, it’s as plausible as it is funny that in the midst of this urgent war council, Desdemona’s dad (David Lively), a senator, stops everything to insist that the Duke come between his foolish child and this – this Moor. The wryly comical incident sets a persuasively natural tone that Munby sustains throughout the play. Even in his malevolence, Milligan’s ever-circling Iago also conveys this off-handed manner of speech. Shakespeare’s rhythm is always discernible, but the actors’ easy delivery serves to heighten the credibility of every line, and thereby the tension of the dramatic arc. It is very effective. In his coolly calculating Iago, Milligan shows us a regular guy, in fact just one of the guys. That he’s a murderous sociopath of course escapes all notice. His controlling hand is quicker than anyone’s eye as he maneuvers unsuspecting characters like pieces on a chess board. He will destroy Cassio (Luigi Sottile in a gentle, good-hearted performance), whose appointment as Othello’s first officer over Iago is the very thing that has set Iago on his horrific crusade; and along the way this single-minded avenger will use Cassio to bring down Othello. A surprise delight emerges in the often merely feckless form of Roderigo, who loves Desdemona hopelessly and from afar. Fred Geyer lends poor Roderigo the pathos of a genuine fool, and not in the better Shakespeare sense of the word. He’s an idiot, and that’s all there is to it. But it’s fascinating to watch Iago coach him to personal ruin: “Put money in your purse,” the puppet-master keeps insisting. Buy Desdemona’s affection. And so this dopey Roderigo follows his obsession into the abyss. Bethany Jillard, radiant as Desdemona, offers a heartbreaking progression from devoted, indeed adoring wife and then suspected betrayer to reviled outcast. After Iago manages to disgrace Cassio, he exploits the moment with double brilliance: He presses the young man to seek Desdemona’s intercession with Othello to restore Cassio’s office, and at the same time intimates to Othello that she is being unfaithful with the deposed officer. The bizarre exchanges between Desdemona and Othello on this subject, he infuriated by her mere mentioning of Cassio’s name and she completely flummoxed by her husband’s swelling rage, come across with the tension screwed to a nerve-fraying pitch. Every time Jillard’s exuberant Desdemona breathes “Cassio” to Meredith’s crumbling Othello, you want to bury your face in your hands. Meredith and Jillard play Desdemona’s death scene with crushing conviction: His humiliation is beyond the red line, her confusion as complete as her fear is palpable. He kills what he loves most and in that act renders himself null and void, this magnificent warrior, this especially believable and far-fallen Othello.